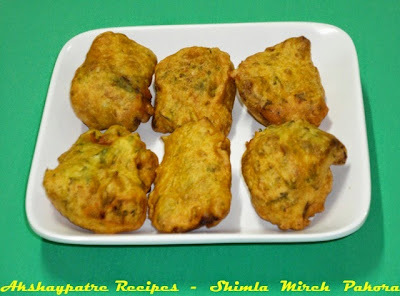 Shimal mirch pakoda recipe - Capsicum pakoda which is also known as dhobli mirchi bhaji in marathi, is really a tempting dish which can be made as a good tea-time snack. Capsicum or bell pepper is an easily available vegetable in Indian vegetable market. It is widely used vegetable in Maharashtra and the bhaji is prepared with different versions in each house hold. Whenever I bring capsicums I reserve few to make pakoda. Capsicum and bessan are basic ingredients, but to make it more tastier the capsicum should be marinated with chilli powder, amchur powder and salt. This bhaji is soft from inside and crispy from outside. It tastes awesome and should be eaten and served hot with tomato ketchup. Wash the capsicums and pat dry. Slit and remove the rind and seeds. Cut them into large pieces. Mix the amchur powder, red chili powder and pinch of salt in a plate. Marinate the capsicums with this mixture. Keep it aside for 5 minutes. In the meantime, mix together the besan, rice flour, corn flour, coriander leaves, pinch of haldi, pinch of chili powder, ajwain and salt. Add some water to make a very hick batter. Dip the marinated capsicums into the batter and deep fry them on low flame till they become golden brown and crisp. Drain the oil. Serve the dhobli mirchi bhaji hot with tomato ketchup. 1. Wash the capsicums and pat dry. Slit and remove the rind and seeds. Cut them into large pieces. 2. Mix the amchur powder, red chili powder and pinch of salt in a plate. Marinate the capsicums with this mixture. Keep it aside for 5 minutes. 3. In the meantime, mix together the besan, rice flour, corn flour, coriander leaves, pinch of haldi, pinch of chili powder, ajwain and salt. 4. Add some water to make a very hick batter. Dip the marinated capsicums into the batter and deep fry them on low flame till they become golden brown and crisp. 5. Drain oil and transfer to the serving plate. 6. Serve the shimla mirch pakoda hot with tomato ketchup. Very good for this weather.. Perfect tea time snack, looks so yummy. Pakodas are always tempting !